Shaping policies determine the bandwidth allocated to a number of applications. Each shaping policy is allocated a maximum incoming and outgoing bandwidth level, and a number of applications to share that allocation. You can assign a shaping policy to more than one Bandwidth class. Applications, and application groups, can be given relative weights on a defined scale. When there is contention for bandwidth within a class, relative weighting is used to proportionately allocate bandwidth for the specified applications. A single application’s weighting is calculated as a proportion of the total weighting for all applications, or application groups, for that shaping policy. The total share for a class does not depend upon which applications are in use. Bandwidth shaping rules are applied before application weighting. Weighting is only used as a fairness measure when traffic exceeds the available bandwidth for that class. In addition to using an application weighting, you can also configure a cap on the bandwidth available for each application or application group. This can be used to provide an absolute restriction on particular services. This configuration gives priority to home working services. If there is excessive demand, Collaboration services receive half the allocation of Remote Access services, and Mail services receive half again. The Mail services slice is smaller as email packets tend to be small and non-interactive. All other services receive the same priority as home working services. This configuration gives priority to all other traffic. If there is excessive demand on bandwidth, named video streaming services receive one tenth of the available bandwidth compared to all others.  Default — This is the “catch-all” policy for those services that are not allocated to another bandwidth shaping policy. All traffic is treated fairly. This configuration gives priority to all other traffic. File transfer services receive one tenth of the available bandwidth compared to all others, but are capped at 32 kilobits per second. This configuration caps available bandwidth for the specified services so that they are slow all the time. This configuration gives priority to all listed above. If there is excessive demand on bandwidth, this configuration provides a dedicated slice of bandwidth to specified services to avoid VoIP latency. The pre-defined policies listed above are defined according to function, and can be altered to suit your own operational needs. However, you can create policies based on a single application, single application group, or a mixture of the above to suit a particular subnet. For example, a school may choose to create a policy which lists all individual applications that need to have restricted bandwidth which accessed from a classroom, and an additional policy that has less restrictive bandwidth for the same applications when accessed from a recreational area. For more information, see Assigning Application Slices. 1. Go to Bandwidth > Control > Shaping policies. • Name — Enter a meaningful name for the policy. • Comment — Enter an optional comment for this policy. You can view each policy’s comments by clicking Show comments in the Shaping policies table. Shaping policies determine the amount of bandwidth that may be used by specified applications. Additionally, you can prioritize bandwidth for specific applications, or application groups. You do this by slicing up the allocated bandwidth, according to the relative importance of the application. You can also apply an additional cap to the amount of bandwidth used by that application.  By configuring an application slice, you are saying that you want to control traffic from specified applications, and application groups.  Applications not specified are not prevented from using bandwidth. The amount of bandwidth is relative to previously specified applications.  Relative weight refers to the relative importance of that application, or application group, specified as an integer between 1 and 100. It may be useful to configure the first application of that slice with a Relative weight of 10, then base other applications and weights around that. For example, if you configure a second slice with a weight of 20, you are saying that applications from slice two receive two times as much bandwidth than those in slice one. These slices are only used as a prioritization method when available bandwidth for that class is nearing capacity. 2. From the Shaping policies table, click the expand arrow to display the Application slices table. 3. Click Add new slice. • Status — Leave this checked unless the application slice is not going to be used. • Name — Configure a meaningful name for this application slice. • Services — Select those relevant services for this application slice. Note that you can select the category name to select all services for that category, rather than selecting each one individually. • Incoming relative weight — Configure an incoming bandwidth ratio as an integer between 1 and 100. • Incoming cap — Configure an optional cap for the amount of incoming bandwidth used. This is either in kilobits per second (kbps) or megabits per second (Mbps). • Outgoing relative weight — Configure an outgoing bandwidth ratio as an integer between 1 and 100. • Outgoing cap — Configure an optional cap for the amount of outgoing bandwidth used. This is either in kilobits per second (kbps) or megabits per second (Mbps). • Comment — Configure an optional comment for this application slice. An additional button, Show comments, appears in the Application slices table if any comments are configured. Clicking this shows configured comments under the application slice name. 2. 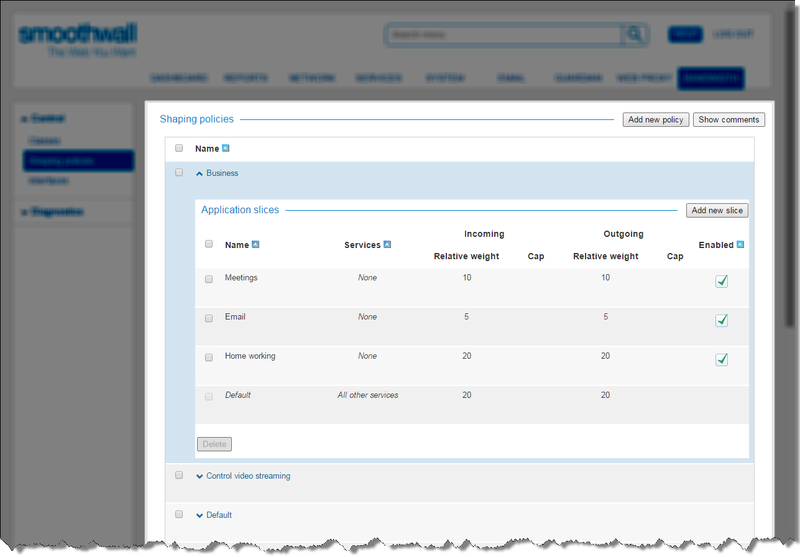 Highlight the relevant policy within the Shaping policies table, and click Edit. 3. Edit the configuration as required. 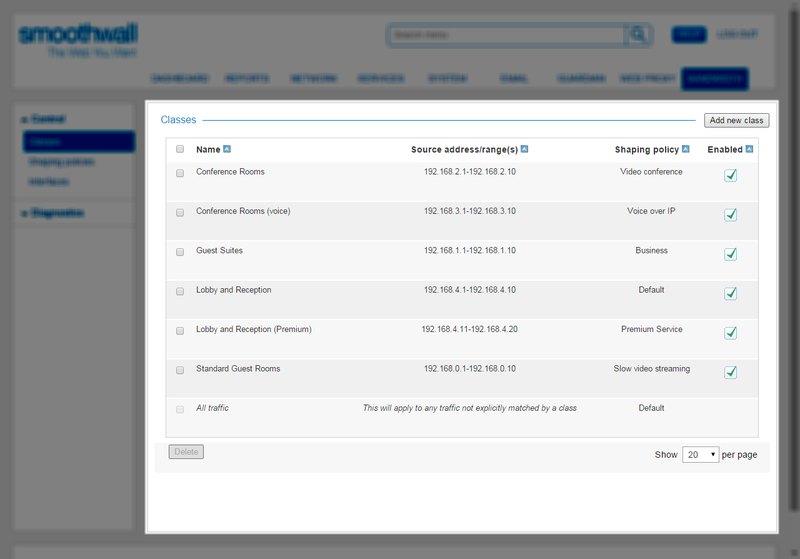 For a detailed description of each setting, see Creating Bandwidth Shaping Policies. Tip: It is recommended that you do not delete unused shaping policies as they may be of use at a later date. They can be left in the Shaping policies table without affecting other policies. 2. Highlight the relevant policy within the Shaping policy table, and click Delete. 3. Confirm the deletion when prompted.  Traffic from Collaboration, Mail, Remote Access, and VPN/Tunneling applications are more important than all other traffic originating from IP addresses assigned to that class. • Collaboration applications would receive two times more bandwidth than Mail applications (10 being two times more than 5). • Remote Access and VPN/Tunnelling services receive two times more bandwidth than Collaboration applications, and four times more bandwidth than Mail applications. • All other traffic would receive a similar share of bandwidth as Remote Access and VPN/Tunnelling services. If traffic matching only one application slice is present, this would use up the full 2 megabits per second allocation as needed. The following example is based upon a hotel offering an internet service to guest bedrooms, conference rooms with separate subnets for video conferencing, and VoIP traffic, and public areas such as the lobby. A single external interface is configured to be shaped, with a total of 5 megabits per second incoming and outgoing bandwidth. The Default shaping policy has been given a cap of 128 kilobits per second for both incoming and outgoing traffic. An additional shaping policy has been added, Premium Service. Similar to the Default shaping policy, this policy is not for an specific service or application. It is capped at 2 megabits per second for both incoming and outgoing traffic.  Conference Rooms — The Video conference shaping policy is applied to those IP addresses specified in the Conference Rooms class. Applications that are listed in the Video conference policy (see Creating Bandwidth Shaping Policies) are shaped if there is excessive demand on bandwidth.  Conference Rooms (voice) — The Voice over IP shaping policy is applied to those IP addresses specified in the Conference Rooms (voice). Applications that are listed in the Voice over IP policy (see Creating Bandwidth Shaping Policies) are shaped if there is excessive demand on bandwidth.  Guest Suites — The Business shaping policy is applied to those IP addresses specified in the Guest Suites class. Applications that are listed in the Business policy (see Creating Bandwidth Shaping Policies) are shaped if there is excessive demand on bandwidth.  Lobby and Reception — This class uses the Default shaping policy. This has deliberately been set to a low level of bandwidth, to restrict users from using excess bandwidth in public areas.  Lobby and Reception (Premium) — This class uses the Premium shaping policy. This allows a greater share of the bandwidth, without restricting it to any particular service. This is to encourage users in public areas to upgrade to the premium service.  Standard Guest Rooms — The only traffic that is shaped from guest rooms is video streaming, using the Slow video streaming policy. This is to encourage users to use the hotel’s own film and video service.  Both conference room types are allocated a guaranteed slice of 2 megabits per second for incoming and outgoing traffic. 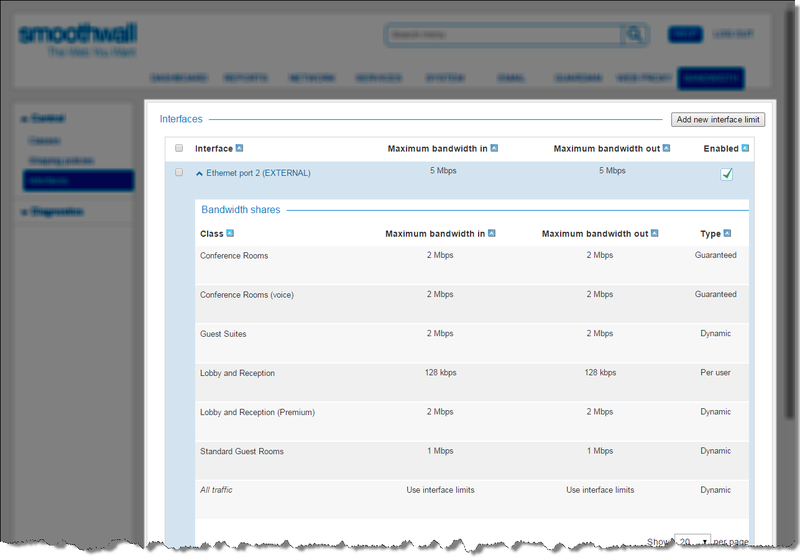 Note that two conference room classes could be combined as their bandwidth allocations are the same.  Guest suites have a dynamic allocation of 2 megabits per second.  Users in the lobby and reception area are allocated 128 kilobits per second each, unless they upgrade to the Premium Service.  Standard guest rooms have a dynamic allocation of 1 megabit per second.